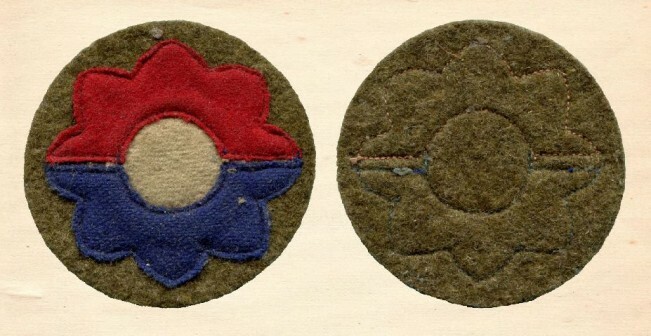 Shoulder sleeve insignia became official for all units after the first World War. 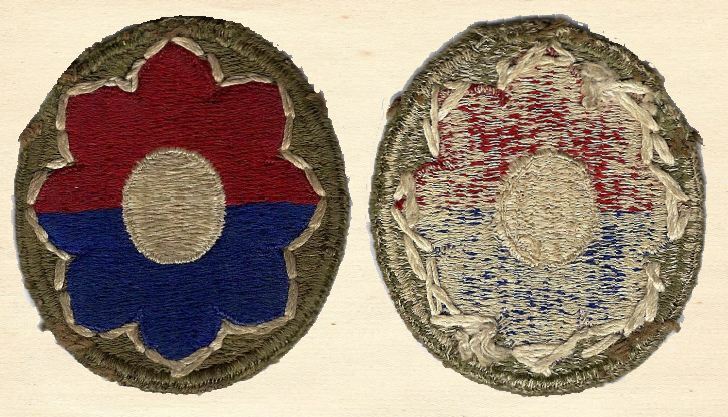 These patches were worn on the left shoulder and each Division had its own patch. From the 18th of November, 1923, the 9th Division – with War Department approval – adopted the “Octofoil” as its patch. It was re designated to the 9th Infantry Division on August 1st, 1942. The selection was a unique one as the design dated back to the 15th Century, when it was customary for each son to have an individual mark of distinction. Perhaps “Octo”, meaning “eight”, is a bit confusing to many when speaking of the Ninth Division. the explanation is that in foiling there are eight foils (positions) and heraldic rules gave the Octofoil to the ninth son, since it was symbolic for his being surrounded by eight brothers. 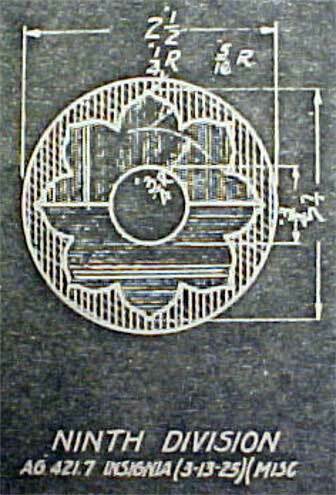 This is the explanation of why this eight petaled insignia is the correct one for the Ninth Regular Army Division. 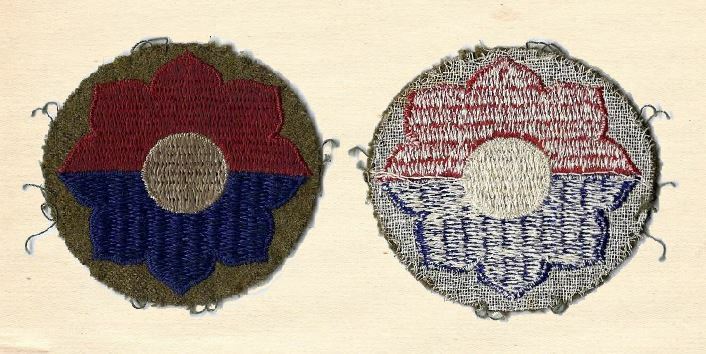 The design chosen for the Ninth Division patch consists of a red quatrefoil atop of a blue quatrefoil with a white center. The red stands for the Artillery. The blue stands for the Infantry. The white denotes the color of numerals found on Division flags. Surrounding the Octofoil is a rim of Olive Drab – Symbolic for the US Army. Nearly all the World War 2 type patches were embroidered on fabric and cut from the master sheet. These patches are called “Cut edge patches”. 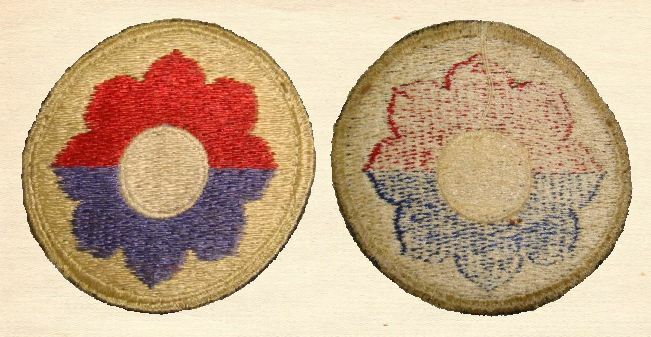 This was the primary production process during World War 2, and these patches are the most common ones. 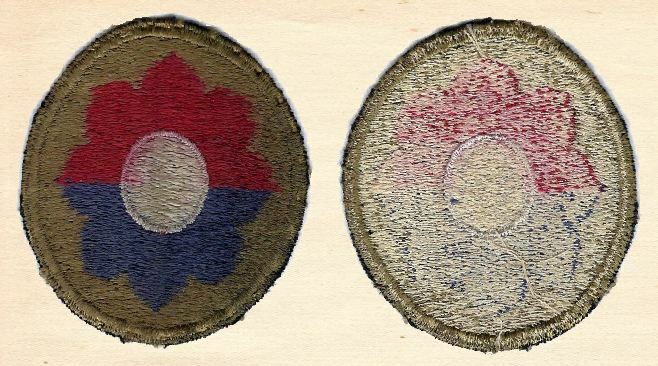 A special embroidery technique used during World War 2 gave certain patches a special look on the back side. They had a degree of white “snow” showing on the threads. The whiteness varies on these, but is clearly visible. These patches are known as “Snow back” or “White back” patches. 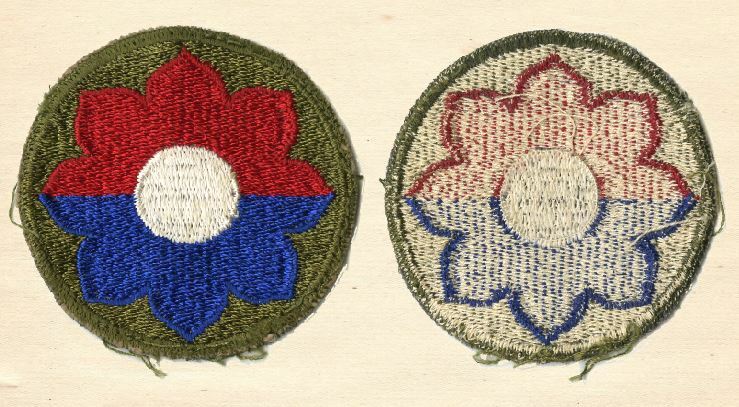 Just like the special embroidery technique for the “Snow back” patches, earlier World War 2 variations were made with a degree of green showing on the threads on the revers of the patches. 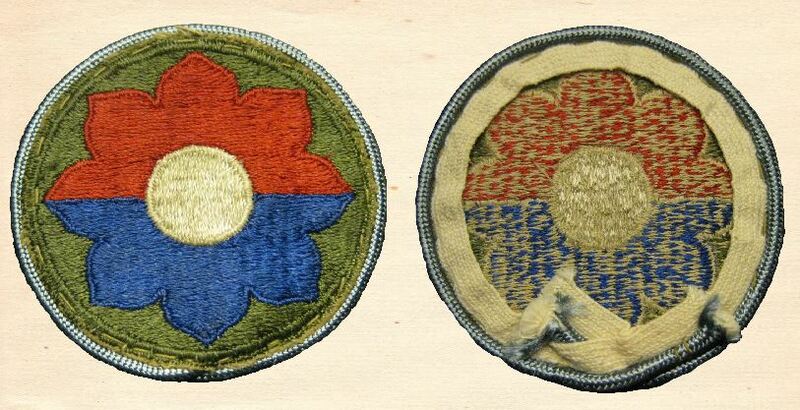 These patches are known as “Green back” patches. Merrowed edge patches have clean tightly threaded edges. They often have a small part of thread on the back, sometimes glued or taped to the patch. 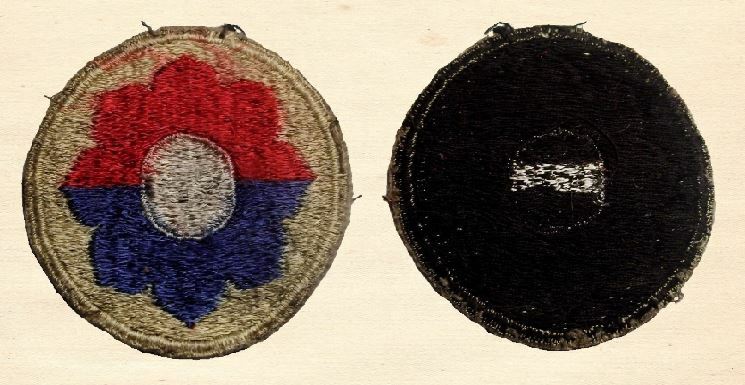 These are post World War 2 patches. Bullion patches have been made from some elaborate metallic bullion embroidery or local materials, creating beautiful patches that make them look as if they are made of gold or silver thread. These are usually pretty rare to find, and also known as “Theater made” patches. 9th Infantry Division Octofoil Patches. Left to right: Post war, reproduction, Woolen early war type, rare Octofoil without olive drab back ground. 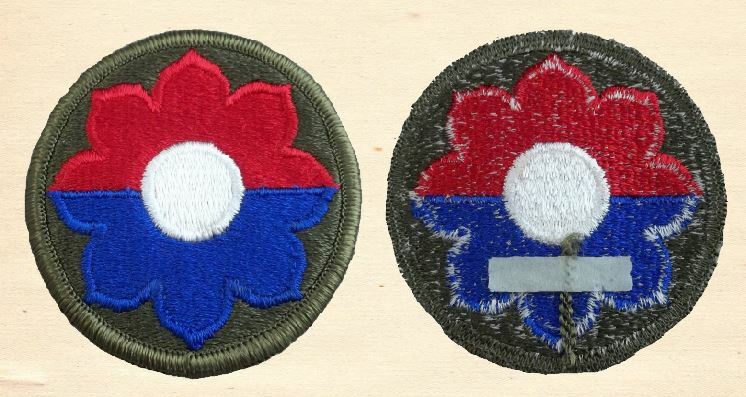 The Octofoil patch can clearly be seen on the GI’s sleeve. 9th Infantry Division Octofoil Patches. Rare variations! Left to right: Theater made in Germany Bullion patch and tab, bigger silver thread version, 4 different types of Bullion patches, and the rare Khaki background type (last 5 are front views only). Oddly shaped pale green woven patch. Octofoil is woven into the pale green background. (left) Snowback (right) Theater made. Oddly shaped pale green woven patch. Octofoil is woven into the pale green background. (left) Regular back (right) Theater made. 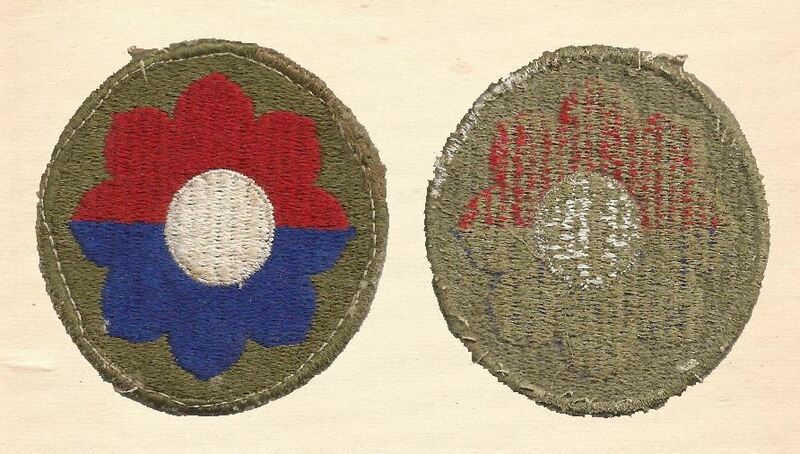 Nice rare Olive Drab patch that has a thicker white cotton outlining the Octofoil. Front (left), Back (right). Hand sewn, red horizontal, blue vertical, on green wool twill patch. 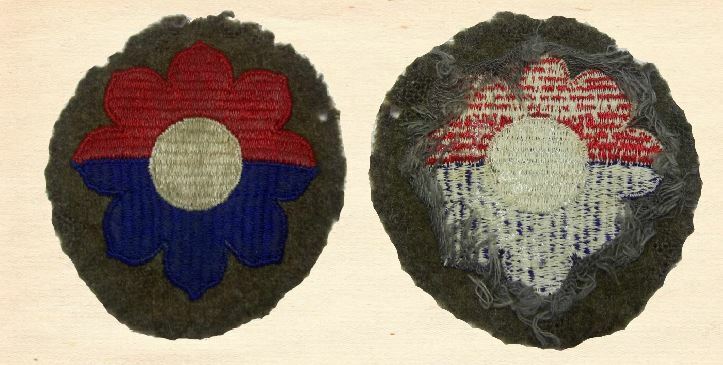 (front, left) The patch was glued in a book, so the back (right view) looks dirty. White cotton is also used. Rare horizontal (red) and vertical (blue) embroidered Cut Edge White Back Patch. Front (left), Back (right). Very rare white embroidered White Front and Back Patch. Front (left), Back (right). Very rare early World War II Olive Drab Wool Shoulder Patch. Horizontal blue and vertical red stitching. Front (left) and back (right). 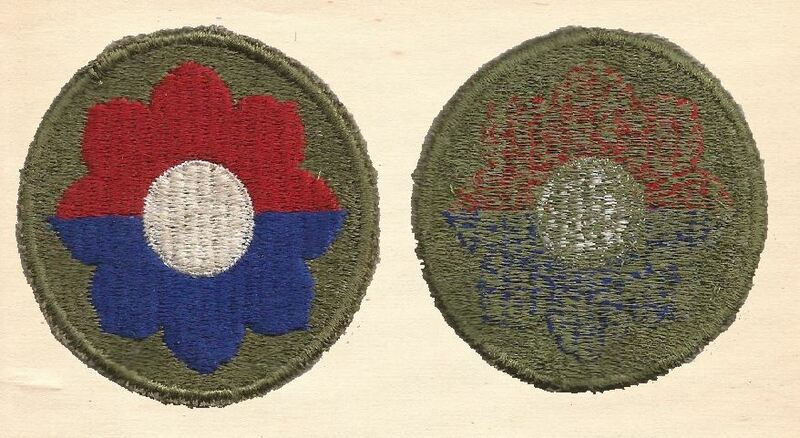 Another rare World War II Olive Drab Wool Shoulder Patch with different stitching. Rare version: Cut-edge British made “Black back” patch. 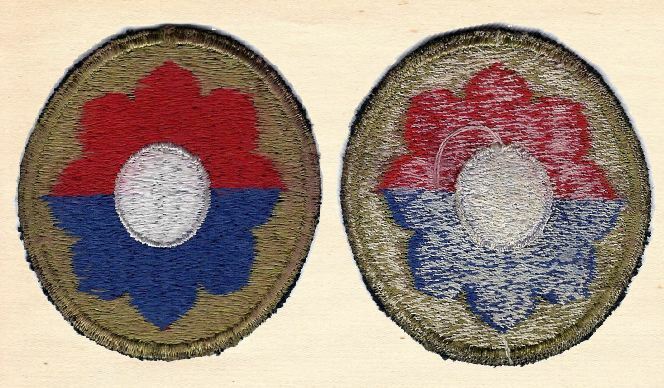 Rare Cut Edge Patch with added blue (Infantry) piping. 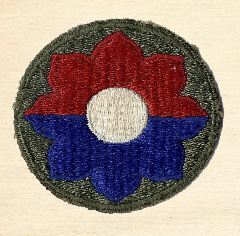 The Octofoil patch worn by the 9th Infantry Division men.